Befores and Durings — Ends in Style. Hello again everyone. We are really trying to get better at consistency. Frankly, life gets busy and it's hard to prioritize the things we enjoy, like writing to you. Since Christina and I are both in the middle of renovations, big life changes, and full time jobs, poor Ends In Style tends to take a back seat over and over. We do love this blog and we love that you read it. I'm sorry we've been so off this year. I've been off this year. But more about that in a bit. In January, my husband Victor and I bought a little house. It has a lot of potential, though sadly, the last 10 years or more it may have been loved by its inhabitants, but it certainly wasn't cared for. The AC and heating units shared a birth year with me. They too were starting to feel creaking joints and were surprised that 30 does indeed feel different. The house lacked insulation, the windows were ancient and cracked and leaking, the bathrooms haven't been updated in 30 years. The kitchen is a very non-committal amalgamation of square white tiles, poorly placed electrical, melamine poorly fitted cabinets, and laminate countertops. Shortly after we closed on the house, I don't even think we'd moved in yet, the roof leaked into the kitchen due to a really bad storm and so we had to get a new roof and are working on the kitchen soon. As much as I want to change everything and NOW, I'm excited by the possibilities and that nothing is newly renovated, so there's no need to feel bad about changing it. We are not limited by much, so we can make this house into our home. We can make it into something we can be proud of! There is so much to do everywhere in and out of the house. So far, we've gotten new doors and windows, removed the iron railing, sold the swing, and some minor landscaping. Eventually, we'll remove the shutters, paint the brick, and change out the siding, along with some other cosmetic changes and some major landscaping. New front door and potted plants. See what I mean? There's still a good bit to do because the front stoop is looking a little "stoop-id", but much better than before! The new door lets in so much more light and really brightens up the place. Also, I love brightly colored front doors. This is Benjamin Moore Citron. A super sunny yellow with a dash of green. For us, very welcome change from the formerly doo-doo brown color it was painted before. In the dining room, we swapped out the double window for one large picture window. 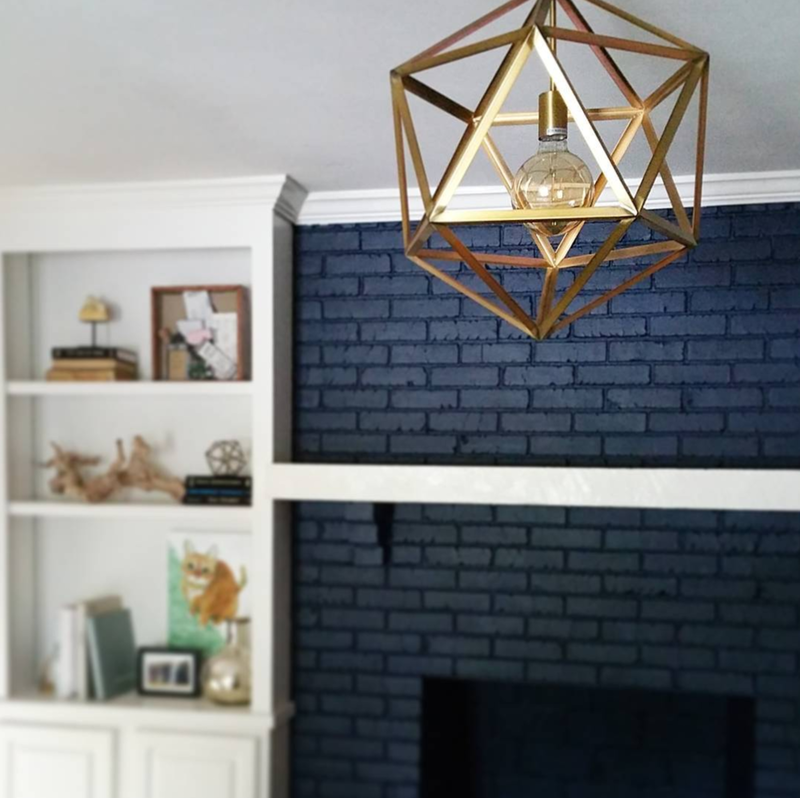 I painted the walls and trim Sherwin Williams Alabaster. There is an accent wall on the wall opposite the window that is the color of the drapes, Sherwin Williams Connor's Lakefront, velvet finish. Soon, we'll hang a chandelier over the dining table (it's almost exactly like the one in the plan) and hang the artwork. I'll also change the styling of everything 500 times. When we bought the house, the laundry room was outside in the carport. That was not going to happen. In college, I rented a house with the laundry room in the carport so I would save up my laundry for approximately six weeks and then try to cram it all into two loads to minimize having to do laundry in an unconditioned space that usually had a hornets nest in it. Rental houses in Statesboro don't always have the best amenities and yet we happily paid each month to live walking distance to class. To be fair, my rent was $300 a month, so I shouldn't be too surprised at the laundry situation or the number of roaches that found their way into the house....shudder. One of the very first things we did to the house was remove the coat closet above and frame the area for the washer and dryer. Victor custom built these lovely cabinets for storage of brooms, vacuum cleaner, laundry supplies, etc. It's so much more efficient for us and I do laundry way more than once every six weeks! We painted the walls a Sherwin Williams color called Porch Ceiling. Since this is the entrance to our house from the carport, so where we come in and out every day, I chose eggshell finish. I prefer flat finish most of the time, but for high traffic areas, a little sheen is best. This wall color is the same as our kitchen backsplash will be once that project gets completed. The fireplace is the most done of any project in the house. You can see the progression above. 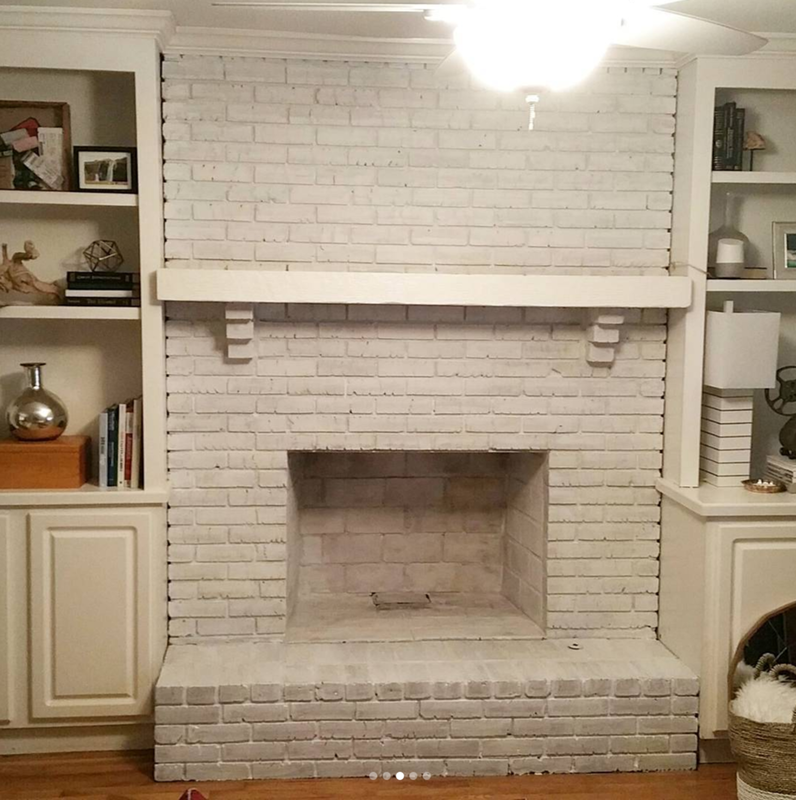 Something to note is to not ever paint the interior of your fireplace if it is a working chimney. We cannot have fires in ours due to cracked flues among other dangerous things costing way too much to fix to be worth it in Georgia. So, we sealed it, painted it, and are making it our own. This color is Sherwin Williams In the Navy, a very deep deep blue. So many times during this renovation I think about my Daddy and about the befores and durings of life. Before he died a few months ago, I would call him for advice about fixing something around the house, or just to talk about the renovation. Growing up, he and Mama made our home in a rural farmhouse built circa 1880. He added a bathroom, built a porch, did dry wall, added central heating and air; almost every single thing you can do to a house to fix it, he did it. The more work we do to this house, the more I think about the sacrifices they made to have a comfortable home and for us to be in a good school district. It's hard work constantly fixing up a house, and ours is only 56 years old! I can only imagine what they took one when I was a three-month old baby and they bought a house that was over 100 years old. Daddy worked long days, sometimes traveling all day, then came home to spend the evenings and weekends building or fixing things around the house. He may have complained about a lot of it, but I have really fond memories of those years. Remember when I said I've been off this year? Well, this is why. Grief doesn't just come right when you lose someone and then go away shortly after. You don't just move on or feel OK. I walk around, trying to do the things I have to do, all the while feeling like I could burst into tears at any moment, and I much more readily tear up in public now. I've become accustomed to wiping away tears in the grocery store aisles when I see something Daddy always loved to eat. The feelings just well up and I want to feel them. Being sad and missing him makes it feel less real that he is gone in a way. Every wall I've painted in this house has some tears in it. I can't work in the yard or do home renovations without feeling the nagging pain that my Daddy will never get to see it. He never made it to see our first home. Before I lost my Daddy, I was short with him and quickly lost my temper with him because family can be hard. Before I knew I was going to lose my Daddy, I didn't call him often and talk to him about his thoughts on wall colors (though he'd be very pleased I chose white for the majority of the house. White walls were a given in his opinion). During my grief, I'm finishing projects slowly around the house, constantly thinking of Daddy. During my heartbreak, I want to feel sad and miss my Daddy. During my loss, I'm feeling like I have a big hole in my head that most everyone around me just doesn't see or want to acknowledge--so they don't mention it to me. I'm not at the afters. They take a while with home renovations and there's always more to do. And I'm certain the afters never come with loss. I know there will be healing, but that part that you can't get back is gone, and it hurts. I'm just floating along here in the during, not quite myself, partially done, but partially undone, just like my little house.